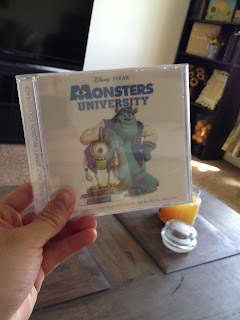 Here's my copy of the Monster University soundtrack! It's fantastic. I've always been a huge soundtrack fan and I love when Randy Newman does the score for a Pixar film. He really captures the Pixar magic with his style that has been there since the first Toy Story. This album doesn't disappoint! It has some great, catchy new themes and even some familiar ones. The actual CD is a limited edition so get one while you have the chance! P.S. The incredibly catchy (what I like to call) "end credits theme" is not on the soundtrack because it turned out that it wasn't Randy Newman. It's a group called Marchfourth Marching Band and the song is called Gospel if you want to track that down on iTunes. You know I did!